With just having purchased an eye-catching pyrite drusy ring set in sterling, I think it's only fair that I share my love of a statement ring that has raw shimmer, sparkle, and shine. 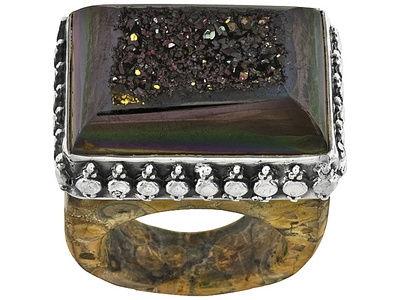 This ring provides smooth, polished stone framing the druzy part, which adds a nice contrast and emphasizes the sparkle and texture of the miniature crystals. The black quartz seems to host hints of other colors, so I am interested in what this looks like in person. Effectively breaking up the black quartz from the leopard-resembling patterned jasper, dimensional and antiqued silver detailing coordinates with the rest of the ring, while also serving as the setting. Quite a design! At almost any price, this ring has major bang for its buck, and is pretty irresistable for $70. If you're not familiar with jtv, I recommend that you check out their site; they can have the exceptional find. Jtv is one of the jewelry sites with the most extensive product descriptions--you can even search for jewelry based on whether or not the stone has been treated. Also, jtv offers an extensive selection of gemstones, from citrine and kunzite to gemstones you may have not have even heard of before or rarely see, such as rhodochrosite and black rutile quartz. As a final note for online jewelry shopping, unless you're buying from the likes of Tiffany's or Harry Winston, I strongly advise that you keep your purchases to semi-precious stones and leave the diamonds and emeralds for in-hand shopping. Enjoy the sparkle!